With more than 15 years' experience sailing and more than 10 years operating charters in different parts of the Mediterranean and the Caribbean, Andreu Castello is an experienced and qualified Captain with RYA yacht-master offshore and PADI divemaster licence. A passionate seafarer, he is kind, cheerful and responsible, and likes to take care of the people around him. He loves water sports and fishing. A good communicator, Andreu can solve any problem on board with ease and without drama. This is the result of his extensive experience on board yachts. With a passion of a sports and professional navigator, complete with Navigational watch Rating Certificate, a lover of nautical sports, he considers the sea to be his home. One of his greatest passions is to explore marine fauna during diving trips and to experience the dazzling colours at the bottom of the sea. He ensures a friendly and relaxed on board service. Trained as a naval engineer, he makes sure that boat keeps on course and that all the passengers have a good time on board. His passion for cooking began when he was just 8 when he began learning the family culinary traditions before training to become a chef. With extensive professional experience leading kitchen staff, on the sea he has united his two great passions and brings to the world a fusion of Mediterranean and Portuguese flavors as he creates his own style. During your wonderful trip on board Feel the Blue, you will have the pleasure of tasting the flavours chosen by Chef Tiago. Andreau is a genuinely good guy with tons of sailing experience. His calm demeanor instilled much confidence regardless of the situation or conditions. Gonzalo and Tiago are genuinely good guys. We loved spending time with them and getting to know about them and their trades. They seemed to truly bond with our son and daughter who were close to the same ages. Gonzalo and Tiago both always seemed to know what we might want before we even asked. Tiago is an awesome chef. Gonzalo always performed his duties quietly in the background when we didn't even know he was doing them. Rooms were spotless before we even finished our morning coffee. Crew maintained the S/Y in tip top condition. It was always orderly and never a single rope out of place or a spot on any surface. S/Y was comfortable but it was the crew that made the experience. 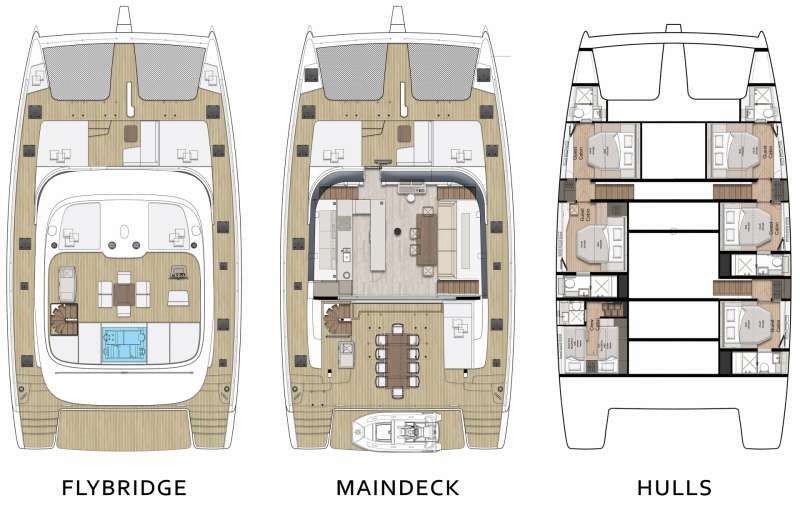 The Sunreef 60 as a sailing yacht needs some rigging and design changes. Design flaws in the mechanicals - particularly with the starboard engine exhaust system caused an engine problem which should have never occurred and nearly necessitated the cancellation of our Charter. The Crew was unnecessarily taxed with mechanical repairs even after the engine replacement at the front end of our charter. The crew needed to perform a bilge pump replacement and perform gasket / seal adjustments under difficult circumstances during the Charter. We never noticed them doing the repairs as they focused on us first and then worked above and beyond to perform the necessarily repairs. The Yacht owner was simply unfair to them in pushing for the acceptance of the Charter when the Yacht should have remained in harbor so that repairs could have been completed properly. The crew never once complained about the situation. But for our own experience as sailors and the owners of multiple watercraft, we would have never known there was an issue. The crew was that good with handling the situation. However, a few bilge pump alarms into the trip peeks the interest of an experienced sailor / yachtsman. We knew exactly what was going on and knew that the S/Y was released from harbor prior to proper drive shaft seal adjustment and setting. Fabulous. We have sailed in the southern Grenadines often but the captain and crew made our experience all that much better with their superior route planning and attention to weather and sea state. Perfect. Scuba gear was top notch. The Williams JetBoat Dingy was much better than any outboard dingy. It was powerful enough to enjoy ocean wakeboarding and versatile enough to get into some beach locations which an outboard could not have. Tiago prepared phenomenal meals and both Tiago and Gonzalo prepared awesome drinks.